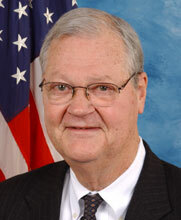 Attorney and Missouri state legislator elected to 17 terms in US Congress beginning in 1976. Conservative "Blue Dog" Democrat; consistently anti-abortion rights, anti-gay rights, pro-death penalty, pro-gun rights. Supported 1990 Americans with Disabilities Act, 1991 Gulf War resolution, 1993 North American Free Trade Agreement (NAFTA), 2001 USA PATRIOT Act, 2002 Iraq War resolution, 2008 Wall Street bailout, 2008 GM/Chrysler bailout, 2009 economic stimulus; opposed 1998-99 Clinton impeachment, 2010 health care reform. Defeated in 2010 election and succeeded in Congress by Vicky Hartzler. Christian First Church, Lexington, MO (Disciples of Christ).